When: Saturday 1 April 2017, starting at 10am. How far: 35 miles, with 3,000 ft ascent. How long: You have 6 hours to complete the event. Ride part of the Stage 3 Route before the pros do. Check out the best vantage points for watching the race on Sunday 30 April. Take the challenge of a 35 mile ride with 3,000 ft of ascent. Tackle 3 of the Races climbs (“Cotes”). Experience the buzz of sharing the experience with other cyclists. 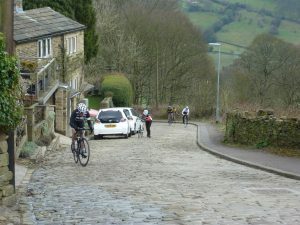 This challenging 35 mile ride covers the local section of Stage 3 of the Tour de Yorkshire, including 3 tough climbs (“Cotes”) – Howarth Main Street, Leeming, and Shibden Wall. Unlike the pros though, you will have 6 hours to complete it, so plenty of time to walk up the steep bits! The route is all on tarmac roads, except for two sections on cobbles. Much of the route is on busy main roads. You need to be confident and experienced at cycling and navigating in busy traffic. This is not a Sportive. You need to be self-sufficient on the ride (although we expect riders to look out for each other). In the event of being unable to continue, you need to have a self-rescue plan (eg friend to pick you up), though telephone the organiser first to see if we can help. Starting in Bradford City Park – the start of Stage 3 – you will follow the route out to Saltaire (where the race officially begins, heading up to the Dales). Then cut across to Keighley to rejoin the section of the route as it heads South. Climb steadily to Cross Roads, then over to Haworth and up the cobbled Main Street then along to Oxenhope and up to Queensbury via the Dog & Gun (Cote de Leeming). Enjoy the drop down to Shelf and Stump Cross, and prepare for the ride up Shibden Valley to the Shibden Mill Inn, and then tackle the 1 in 4 cobbled Lee Lane known as ‘Shibden Wall’! Then it’s back up to Queensbury and a run back down to Bradford. Your cycle should be in a safe, legal, and roadworthy condition. You should be experienced at cycling in heavy traffic, and must be aware of other users, ride safely and follow the Highway Code. There are no marshals on the route. This is an unsupported ride. Other riders may offer mutual assistance, but you must be self-sufficient and should have the means to make minor repairs (eg change an inner tube). You should able to navigate the route using the route information provided. The route will not be sign-posted. You should take into account the variety of riding styles and abilities of other cyclists. Take care not to reduce your standard of cycling when consulting route sheets, and stop in appropriate locations. In the event of being unable to continue, you must have your own back-up rescue plan. There is no ‘sag wagon’. It is highly recommended that you carry a mobile phone. If you are unable, or choose not, to complete the route and return to the start, you must contact the organiser to let them know of your plans. Any road cyclist is strongly advised to have Third Party Insurance. This is provided when you join a national cycling organisation such as Cycling UK. The cost of entering this event is £5. This covers our admin and printing costs. Any surplus generated by the event will go to financing future activities. Online and Postal entries are now closed. However you can still enter on the day. By Train. Bradford Interchange railway station is 400 yards away, and Bradford Forster Square railway station is 0.5 miles away. By Car. Broadway Shopping Precinct Car Park is 0.5 miles away, and costs £1.50 to park for the whole day at weekends. The Pavilion Café will be serving hot and cold refreshments before and after the event. Please patronise this café as they are supporting our event. City Park’s toilets are next door. 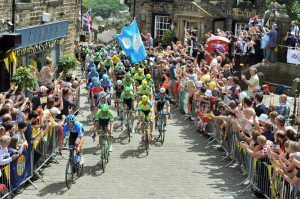 There are plenty of shops, cafes and Supermarkets en route (Keighley, Haworth, Oxenhope, Queensbury).